Although the California Solar Initiative (CSI) has dominated renewable energy headlines, New Jersey’s Solar Renewable Energy Programs (part of New Jersey’s Clean Energy ProgramTM (NJCEP) administered by the New Jersey Board of Public Utilities, NJ BPU) are among the best in the United States. 346 Solar Systems totaling 4533kWp of solar capacity were installed in Q1/2006 with $21.25 Million in NJCEP Solar Rebate assistance. 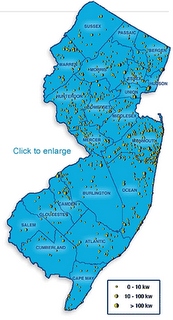 This represents 82% of New Jersey solar capacity installed in all four quarters of 2005! The CORE Program offers “financial incentives” (rebates) of $4.35 per watt for residential solar electric systems of 10kWp (10,000 watts peak) or less in size. This CORE Program incentive covers about 50% of the solar electric system’s cost. The financial incentives for private and public/non-profit solar electric systems of various sizes are shown in the New Jersey Clean Energy Program Incentives – Chart II for applications since 3/15/06. CORE Program incentives have driven a boomlet in New Jersey private solar electric installations, and solar rebate applications have outpaced program funding. As a result, private sector solar rebates are being held in an application queue until final rebate approval is issued by the NJ BPU Office of Clean Energy. There are rebate queues for systems less than or equal to 10kWp (CORE Queue LT 10 kW) and systems greater than 10kWp (CORE Queue GT 10 kW). These queues provide solar installers and manufacturers a competitive view into the New Jersey solar photovoltaic market. New Jersey exempts solar photovoltaic installations from the state’s sales tax (increased to 7% on Saturday, July 15, 2006) although there is no property tax exemption. In addition, New Jersey solar photovoltaic installations are eligible for the Federal – Residential Solar and Fuel Cell Tax Credit for 30% ($2,000 maximum) of the purchase and installation cost of a residential solar photovoltaic system. Almost every practical solar photovoltaic system easily qualifies for this tax credit which directly reduces your US Federal income tax bill. New Jersey’s revolutionary SREC Program creates tradable Solar Renewable Energy Certificates representing the clean energy benefits of electricity generated by solar electric systems independent of the actual power. An SREC is issued for every 1000kWh (1MWh, 1 megawatt-hour) of electricity a solar facility has generated and delivered to the grid, either through estimated or actual metered production. SRECs facilitate a medium of exchange for individuals and businesses to finance and invest in clean solar electricity. New Jersey‘s Renewable Portfolio Standard (RPS) requires electricity suppliers to provide a percentage of their electricity sales from solar generation, and the NJ BPU requires electric suppliers to purchase and retire SRECs to satisfy this requirement. In April 2006, the NJ BPU increased the Renewable Portfolio Standard (RPS) for renewable energy to 20% of New Jersey’s electricity by 2020. The new RPS mandates 2% from solar photovoltaic or an estimated 1500MWp of installed solar electricity capacity by 2020. New Jersey launched the world’s first on-line marketplace for trading SRECs on June 25, 2004. Once a solar facility owner has registered and opened an SREC account, SRECs are automatically accumulated on a monthly basis. SRECs may only be traded in discrete 1MWh increments and have been trading for about $200 (or $0.20 per kWh) in March 2006. Solar Alternative Compliance Payments (SACP) allow suppliers to satisfy their solar generation requirements by paying $300 to the NJ BPU fund in lieu of each SREC, capping the price of SRECs. In effect, the SREC Program encourages efficient solar electricity production and provides an additional payback revenue stream for the solar facility owner. For example, a 5kWp solar facility in southern New Jersey is estimated to generate just over 6MWh (1200kWh per kWp annually) of electricity or 6 SRECs per calendar year. At $200 per SREC, this represents $1200 of annual income for the solar facility owner in addition to the electricity savings from grid connected, net metering. If they are willing to forego this income, solar facility owners can retire their own SRECs or abstain from the SREC program to retain the clean, green benefits of their solar electricity production. energy projects. Grants and financing are available to encourage the development of large-scale renewable energy facilities larger than 1MWp. Grants are available to finance up to 20% of eligible, renewable project development costs. The NJ EDA can also arrange long-term, low-interest rate bonds or loans to finance the balance of project costs, although project developers are required to make a minimum 10% project investment.